Being the FTSM (First Time Summer Mom) of a preschool aged child, I now pay attention to and read the other funny articles and self-deprecating mommy- blog posts on coping with summer vacation/ end of the school year panic and fatigue. This one has been circulating wildly around my Facebook feed and while I can’t totally relate yet, I now get it more than I would have cared to before. Personally, school for my son has been an amazing, transformative and life-saving transition. For me. Really. For the 3 years before school started, I lived unstructured days with two very small children, struggling to fill time from sun-up to nap time and nap time to bedtime. At least that’s what it felt like most days, if I’m being honest. However, a nice perk I realized was that after 15 years of working professionally, having limited flexibility in my schedule and spending the last 5 years of it commuting 3 hrs each day to the Silicon Valley, the initial openness and freedom of a day on maternity leave was sweet and delicious. I loved that I didn’t use my car, have hard deadlines and could relish in focusing on a new little being without attention being pulled in multiple directions. That was year #1. Years 2 and 3 at home began to get difficult for me and I missed a routine and purpose in leaving the house. Sometimes I wistfully gazed at the receptionist at the doctor’s office, for example, thinking, “Wow, you got up, showered, you’re here doing your job and making plans to go to lunch with friends. Sounds AMAZING!” On some days, I was really, really jealous of the receptionist. Once my son started school, a new routine began of drop-off and pick-up, 5 days a week, every morning and I loved it: Getting up to an alarm again (I can’t believe I’m saying that), showering and anticipating the few fleeting minutes of social time at drop- off with the other moms. I felt I had a purpose and a place to be, at least at 8:45 and 11:45. And I’m sure my son got some benefit from school, as well! Smirk. As the school year was drawing to a close, I had my first, “Holy Hell” moment of, “What do I do once school is out?” Complicating matters was knowing that I would also be facing down my last few weeks of pregnancy #3. A rough combo. Thankfully, my son’s preschool offered a summer school option that we’re taking advantage of, but until then have 2 weeks off in the interim. I recently read another blog post about a fellow mom/ blogger attempting to be a super summer mom (June 6th post) and thought it was funny and honest. I don’t know that I’ve aspired to be anything quite that heroine like, but I did think that I could attempt, at least a few fun outings with the 2 kids despite my expanding girth and decreasing mobility. Over the course of 4 days I offered outings to the zoo, the park and walks over and over again. And each time, my 4-year-old said, “No thanks. I’d rather stay home and play.” And we did. Just stay home. And it dawned on me that my little guy has been on a treadmill, too and needed some decompression time. After a big first year of school, he got up every morning, 5-days a week and went to his “job.” Every weekend morning, we typically threw the kids in the stroller to go for walks, get coffee and get some outside time. The result is that there were few mornings during the year where my son could just have some leisurely play time at home. In pajamas. Nowhere to go. And that’s just what he wanted to do. When I took a step back and just let him direct the day, I could see that all he wanted was non-scheduled time. Well, of course he did. I’m sure he felt like those first few months after I was on maternity leave where I realized, despite exhaustion and the feeling of being overwhelmed, the beauty of having nowhere you had to be. No shower necessary! No need to dress up. And my son reacted the same way. I have to say we had some good days at home and it worked well with my increasingly tired, pregnant self to just lay low. Like some overused mommy cliché, when given free time, my son actually got out a cardboard box for some self-directed imaginative play, “Let’s make a fire station and pole!” And had a blast entertaining himself and playing with his sister all day long. The other change I made, which is quite rare, is took a day off from trying to multi-task around my house like a crazy woman and just sat on the floor and played with the kids or was able to just be there in the room when they were playing, which they LOVED. I was a passive part in their imaginative play. “Mommy, you’re in the wheelchair and we’re taking you to the hospital….weeeoooooweeeoooo!….Ok, it’s another ambulance emergency.” And they’d scamper off and back again. And I’ll had to do was sit there to play my part! You’d think as a mom who is home with her kids, this would occur ALL THE TIME. Play time: mom & kids, around the clock! I’m sure I thought it would be the case before I had the kids. But it’s amazing how much of the non-glamorous house stuff you have to do all day long to keep everything running smoothly. 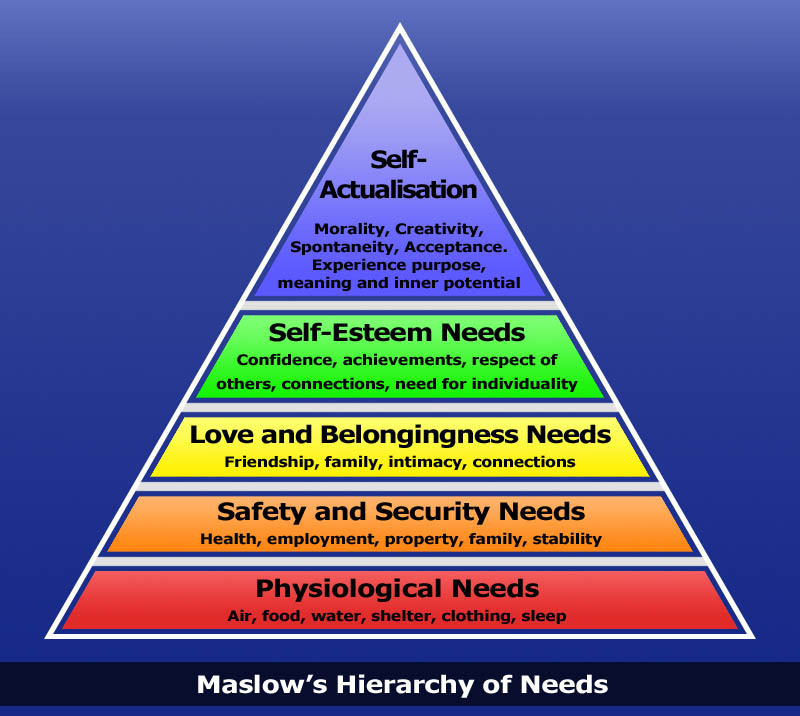 Maslow’s bottom- of –the- pyramid hierarchy of needs kind of stuff. You know food, water, shelter, clothing, sleep. It’s interesting because I’m a big believer in some of David Elkind’s philosophies espoused in the “The Hurried Child.” My central take away being, to slow down and decrease planned activities, refuse the pull to over schedule and focus on free play. I thought I was embracing this by having almost no outside school scheduled classes or activities at such a young age. However, I realized that the pull of all of the tantalizing places to go right outside our door was a double-edged sword, causing me to get up and out of the house and inadvertently “schedule” our “unscheduled” time. My ah-ha moment this week was that it’s good to just take a “time-out” in the best possible way and find the fun things literally in our backyard. I can’t say that I plan to have boxes of homemade crafts and art stations and all other manner of ready- to- go- at- home activities all summer. We have this 3rd kid thing looming and all. But I will, when I can, take time to take a “day off” with my kids, get on the floor and just be. Lesson #1, I guess from this FTSM (First Time Summer Mom). Last year, when I went through this I went the activity everyday model. I felt that worked pretty well. But instead of a hard out the door by 745am routine we sauntered out by 9am after the train wasn’t as crowded. But that was with a 3.5 and 2 yo and my wife was preggers with #3, not me. This year with my wife and I both working we tried something different: All three kids are in India with their grandparents for a few weeks. PS, dare I ask, but when will you be covering the 3 and out versus 4 down territory topic? Quite a hot debate topic in our house these days. Previous Previous post: “Let’s walk home from the hospital!” And other naïve new parent assessments about bringing home baby. Next Next post: “But Why?” My existential trip to gain a Residential Parking Permit.